Hundred and One Antiques successfully specializes in Fine European, Oriental and Islamic Antiques, Ancient Art, and Antique Arms and Armour from around the World for over 35 years. Our company only invests in the finest of collections, for the connoisseurs of antique swords and daggers, antique armor: axes, helmets, shields and maces, antique pistols and guns. Besides weapons we also sell high-end Islamic Ceramics and bronzes, Oriental Porcelain and Bronzes, Antiquities and Pre Columbian Art, Oceanic and African antiques. 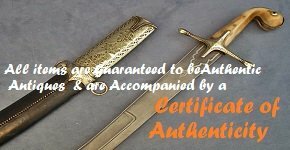 ALL ITEMS ARE GUARANTEED TO BE AUTHENTIC ANTIQUES, AND ARE ACCOMPANIED BY A CERTIFICATE OF AUTHENTICITY.